This modest hill station that is not known to many and has still retained its beauty should definitely be on your travel itinerary. Chikmagluru has a good number of hotels and home stays that have been built to blend into the natural environs. The main city offers decent hotels for a daily rent of Rs. 1000/-+ per day. However, you should be heading towards the hills if you are visiting Chikmaglur for pleasure! I stumbled upon one such homestay named – The Spectrum while discovering Chikmagluru. It roughly takes half an hour drive by cab or auto from the main city area. This place in nestled in the hills and is surrounded by coffee plantations. The lane that leads you to the main gate is flanked by little houses owned by locals. Neat, tidy and well-maintained…this is how I would describe it for the traveler who likes to be amidst the greens without compromising on the interiors and hygiene factor. The rooms are large with flat screen TVs (yes, there is cable TV here) and the walls are adorned with photographs and funny quotes to lighten up the mood. There are a total of 5 rooms available. You will find a mineral water bottle, chips and biscuits on arrival as complementary goodies. The bathrooms are large and spacious, the water cold and clean. The backdoor of some of the rooms have the advantage of facing the forest behind. Delicious! You may put on a few pounds if you are not careful. The food is simple, tasty and made by a great in-house cook. The variety is large and you can feast like a king! I love South Indian food and the rasam blew my mind away. Two types of rice are served- plain and a specialty of the day for lunch and dinner. There is also salad, roti, two types of vegetables and dal. The sweet dish can range from halwa to puran poli, depending upon the occasion! The breakfast includes South Indian delicacies such as Idli Sambar/Chutney, Set Dosa, Dosa, Puri with Bhaji, etc. Evening snacks include mirchi bhajis, pakodas, etc. How can I visit Chikmaglur without going ga-ga over the coffee! The delicious, fresh fragrance of the coffee stimulates your appetite making you want to eat more. The coffee here is way too good and I was always greedy for more! Yum! The service is prompt. They have fixed breakfast, lunch and dinner timings but that is not an issue. With such delicious food being served, I always ended up being there at the dining area way ahead of the schedule. The rooms are cleaned properly; however, you may want to carry your own towels. I must make a mention of Mr. Shashi who clearly manages the place well. The night time is beautiful! When you step out of your room, you are enveloped with darkness of the thick green cover. You can listen to the forest insects communicating with each other. There is pin drop silence and this makes it ideal to rejuvenate your senses. Imaging dining at a large table surrounded by greenery with no sight of civilization! It only whets up your appetite even further. There is no network unless you have a BSNL connection. The staff provides access to their mobile phones in case of any issue. I really think it is good for people who need to be disconnected for being connected all the time. Besides, there aren’t too many activities out here as the area is small. There are frequent power cuts but that is fine as you can’t really expect a city life out here. Then the whole idea of enjoying with nature is lost. But don’t worry; there are generators and hot water facility also. Your own towels for sure. Drinks – if you want a taste of alcohol with your food. A flash light just for safety. Books to read. Drawing books for illustrators as artists will surely enjoy this place. Also pack a basic medicine kit. 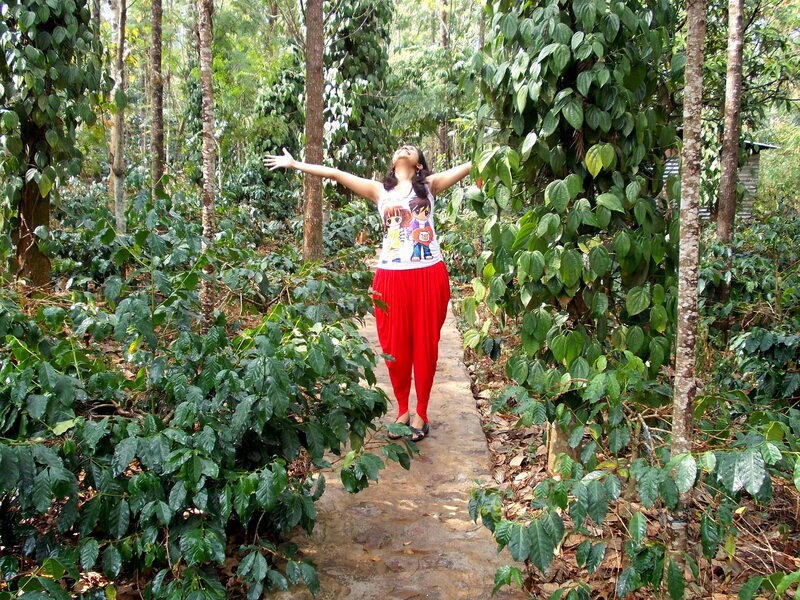 There is more to explore in Chikmaglur if you are planning to stay here. You can book a cab and travel to the attractions that draw many tourists from Karnataka and beyond. More about the tourist destinations in my next blog. Do share your comments and feedback for sure!